The event is this Friday at ThisDay Dome and I'm giving out 5 tickets to LIB readers based in Abuja. Here's how you can get a ticket to attend this grand event. 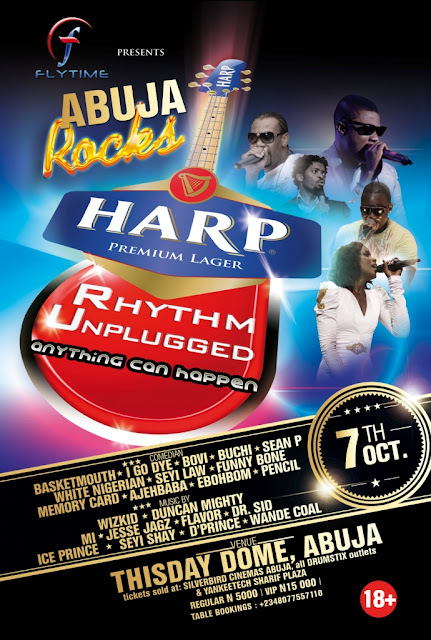 The first five people to go to Rhythm 94.7fm office in Abuja gets the tickets. Ask for Lola, tell her you are from my blog and she will give you a ticket. There are only five tickets available, for the first five people to get there - so hurry! Linda why did you remove the chima anyaso divorce story? that's very biased of you. Post my comment before I vex. linda so na only five people dey read lib ,you better dont give anyone oh or else i will turn to boko haram on this blog,because this is pure ojoro. Na wah o Linda..E be like say i dey smell rat for dis ticket thing o..Na only two people announce for here..say dem don collect...meanwhile, when i reach dere, dem talk say de ticket don finish..Haba! dem nor suppose come report for hia...if dem win am, abeg prob this free ticketgate o! Linda just so u know i picked up my ticket dis afternoon at the station.